In this two-part article we pit that most British of horror institutions Hammer Film's biggest series and biggest stars against each other in a battle for horror movie supremacy. 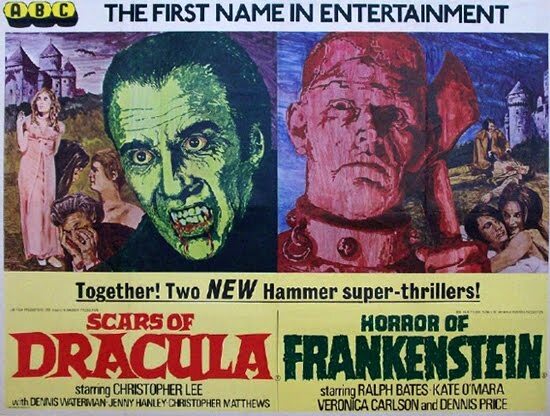 Will it be Peter Cushing's Baron Victor Frankenstein or Christopher Lee's Count Dracula? 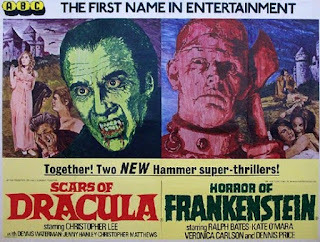 The box office success of Frankenstein in the previous year ensured the next logical step in establishing Hammer's reputation as the new home of horror. Dracula (The Horror Of Dracula in the USA) saw the iconic duo of Christopher Lee and Peter Cushing return. 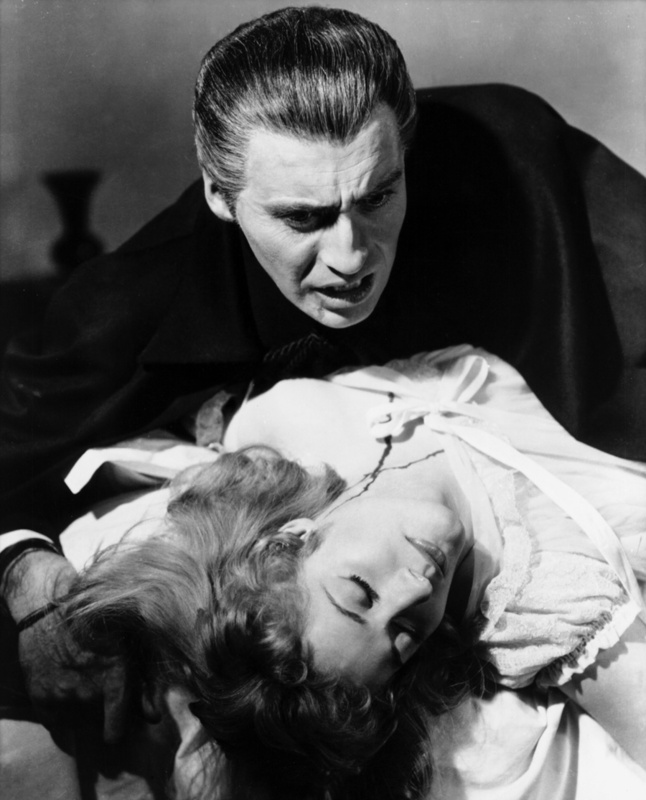 This time however Cushing took the mantle of Dr. Van Helsing – a force for good against Lee's personification of evil, Dracula. Lee is free from a lot of intrusive make up and is free to add his own brand of panache to the role, while Cushing gives Van Helsing a suave demeanour. The best part of this pairing though is that both actors display the ability to remain restrained and civil, but still engage in explosive action sequences at a moments notice. The story itself is a rather liberal reworking of the original Dracula tale and features Jonathan Harker (John Van Eyssen) as Van Helsing's vampire hunting apprentice, which leads to his demise early in the film. Lee cuts a far more imposing figure as the count than the Bela Lugosi did in the tamer Universal Pictures predecessor and with the more overt sexual atmosphere and lashings of bright red Kensington Gore Hammer's First outing left an indelible mark on Horror cinema. Even the BBFC was impressed, though the graphic contents of the film was certainly not to their collective taste:"The uncouth, uneducated, disgusting and vulgar style of Mr Jimmy Sangster cannot quite obscure the remnants of a good horror story, though they do give one the gravest misgivings about treatment. [...] The curse of this thing is the Technicolor blood: why need vampires be messier eaters than anyone else? Certainly strong cautions will be necessary on shots of blood. And of course, some of the stake-work is prohibitive." Finance trouble may have dogged pre-production of the film. But the combination of Lee and Cushing's rising star power as well as the strong direction from Terrance Fisher combined with the set design of Bernard Robinson saw that the film did well around the world and as a result Universal Pictures granted Hammer the rights to remake it's famous collection of monster movies. The success of the first Dracula outing meant a follow-up to capitalise on the character's popularity was quickly rubber-stamped and put into production. 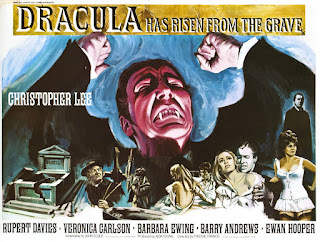 Originally slated to feature Cushing and Lee once more, Lee subsequently turned the part down and the head vampire was re-written as Baron Meinster and played by David Peel (They Who Dare, The Hands Of Orlac). "Transylvania, land of dark forests, dread mountains and black unfathomable lakes. Still the home of magic and devilry as the nineteenth century draws to its close. Count Dracula, monarch of all vampires is dead. 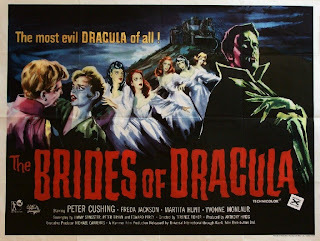 But his disciples live on to spread the cult and corrupt the world..."
Nevertheless, The Brides Of Dracula sees a great performance from Cushing as Dr. Van Helsing that manages to tie an otherwise far-removed plot back in with the original film. 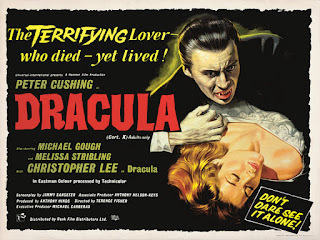 In conjunction with another strong script from Jimmy Sangster and direction from Terrence Fisher the film remains an integral part of the Dracula series despite it lacking the count's dark presence. Jimmy Sangster would later contest that he didn't actually write any lines for Dracula to speak. But either way, the film is missing something with out Lee's sinister and booming voice. Instead he hisses like a cat at his victims before they ultimately get the better of him. The film was filmed back-to-back with Rasputin, The Mad Monk which itself sees a stunning performance from Lee. Both films used much of the same sets and cast members but both remain very individual due to the strength of each film. 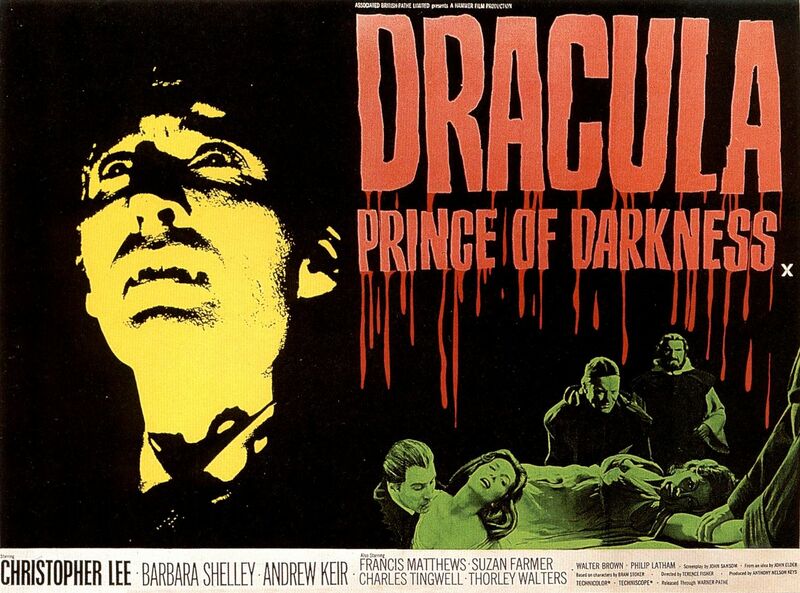 Dracula: Prince Of Darkness does remain one of the most popular films in the series though as strong production values, a great score and of course the box office power of Lee (silent or not). 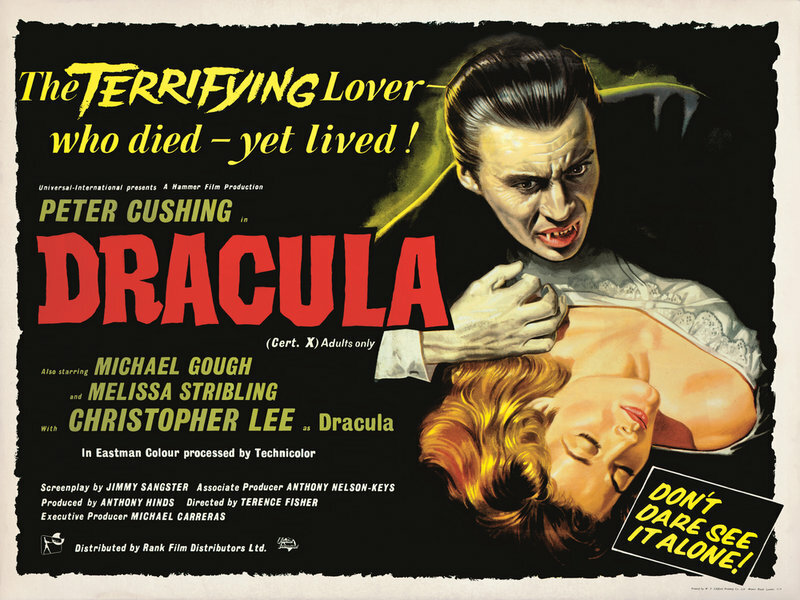 The fourth film in the series, and the third to actually feature the title character, Dracula Has Risen From The Grave was the first of the films to be shot at Hammer's new Elstree Studio rather than at Bray, meaning that some of the most iconic set locations linked to Dracula's domain (i.e. the approach road, coach path and moat) were missing. Also missing from the film was director Terence Fisher who had to drop out due to illness and relinquishing the reins to Freddie Francis. The film picks off a year after the events in Dracula: Prince Of Darkness and is a direct continuation with the count resurrected from the fate that befell him in the previous film. The film's plot is not dissimilar from its predecessor with Dracula praying on the young, innocent people who wander into his clutches, yet manage to best him at the end of the day. Again the figure of Van Helsing is noticeably missing from proceedings, yet the character of the Monsignor played by Rupert Davies (Quatermass II, Witchfinder General) serves to give the count a worthy counterpoint. The film is an adventurous outing for the franchise that makes use of colour filters and direction influenced by Freedie Francis' experience as a cameraman which makes up for some of the weaker aspects of what often feels like a plot recycled from the previous film. 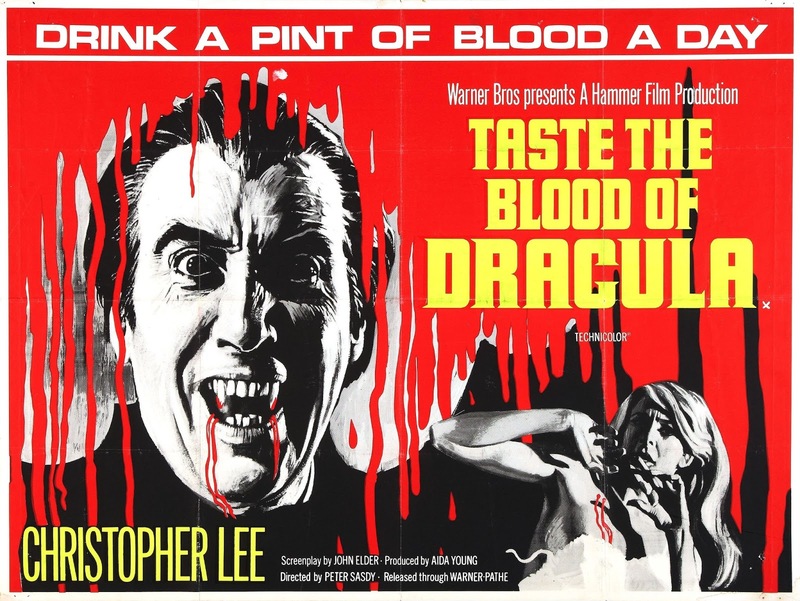 Taste The Blood Of Dracula is another direct continuation from its predecessor with the film opening with the death of the count from Dracula Has Risen From The Grave. The film shakes things up a little this time by shifting the story to London and seeing the count dish out some overdue punishment to those who killed his Byronic servant Lord Courtley, played by Ralph Bates (The Horror Of Frankenstein, Lust For A Vampire). Due to Christopher Lee's increasing reluctance to play Dracula the film was originally to see Ralph Bates' character as the principle villain and interestingly, before the films budget was cut, Vincent Price had been linked as one of the decadent gentlemen. Again, Dracula is defeated by the innocent young victims of his monstrous rampage, however with the count motivated by a more tangible sense of revenge against the more dubious characters in the film the vampire gains a little more depth to him. 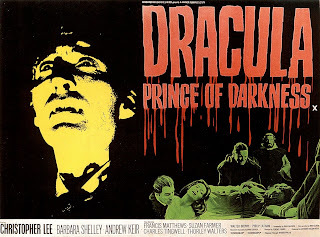 The film is perhaps most enjoyable s a part of the film cycle when viewed in quick, chronological succession along with Dracula: Prince Of Darkness and Dracula Has Risen From The Grave. Whereas when viewed as a standalone film it tends to feel a little shakier despite having a slightly more involved plot. As such, subsequent viewing may be hard on the film, but it is by no means a poor outing for the count. Scars Of Dracula jumps from London back to Transylvania with no explanation, thus breaking with the continuity pattern of the previous films in an attempt to reboot the franchise. 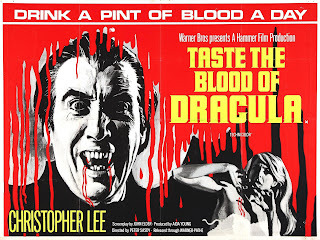 And indeed this outing sees not only Christopher Lee having the most dialogue and action in any of the films since the first, but it also has a darker tone with various sadistic acts and even an impalement of one of the count's victims in a nod to the real-life inspiration behind Dracula. In this film the character of the count is more well rounded and some of the powers, previously only seen in his original literary outing, are returned to him. Here we can see that count commanding the forces of nature and evolving from the somewhat, proto-slasher villain presentation of some of his previous outings into a far more demonic entity. 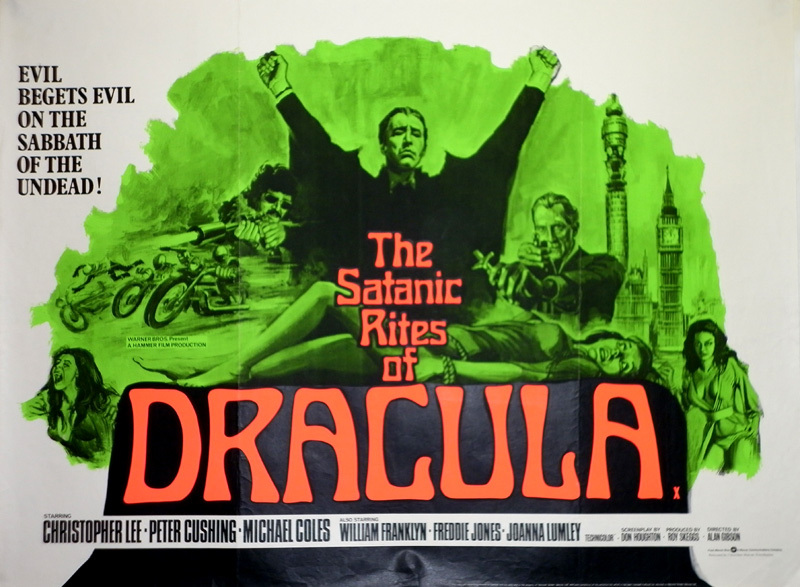 The director Roy Ward Baker, who already had an impressive list of film and TV credits and had previously directed the brilliant Quatermass And The Pit in 1967 brought a similar US-friendly style to his first Dracula film. Coupled with a strong script courtesy of Anthony Hinds AKA John Elder (The Evil Of Frankenstein, The Kiss Of The Vampire), on paper anyway it is a strong outing for Lee's Dracula. Nevertheless the film has received mixed reviews since its, and while it didn't set out to completely reinvent its franchise in the same way as The Horror Of Frankenstein did, it has perhaps been a case of guilt by association as it was previously presented as a double bill with the Frankenstein remake. However when viewed as a standalone film subjectively, it is apparent that Lee's strong performance and the much darker tone make this a great film in the series. The second attempt to reinvent the count and make him more terrifying to a modern audience saw Dracula whisked away from his Victorian setting and into swinging London (albeit a little late for the swinging sixties themselves. Dracula A.D. 1972 is somewhat of an anti-climax that feels almost like a re-write of Taste The Blood Of Dracula transposed into a recognisable setting to capitalise on the Highgate Vampire case and the film Count Yorga, Vampire (1970). However it is notable for the return of Peter Cushing to the series who plays both his original role as Lawrence Van Helsing (who dies battling Dracula in London in 1872 – some years before they meet in Hammer's first Dracula outing), as well as his descendent Lorrimer Van Helsing. Cushing gives the film a definite kick that brings back the element of a deadly cat and mouse game between the two adversaries. The film, despite its attempt to be a modern re-telling of the gothic villain has dated horrendously thanks in equal parts to the stereotypical “hippie” victims and pseudo-blaxploitation soundtrack courtesy of Mike Vickers (Manfred Mann). Though, speaking of the soundtrack the two songs by the band Stoneground, 'Alligator Man' and 'You Better Come Through For Me', as well as the track 'Black Mass: An Electric Storm in Hell' by White Noise redeem it. Dracula A.D. 1972 has a cult following mostly due to its kitsch execution, but fundamentally it re-establishes a great dual performance from Lee and Cushing as the forces of good and evil that sets up the following film quite nicely. 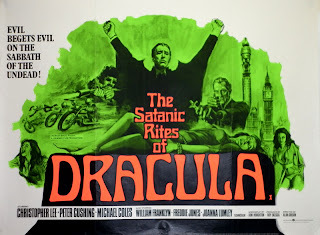 The Satanic Rites Of Dracula once again sees Lee and Cushing go head to head once more in the modern city of London with a plot that attempts to move Dracula beyond his primary compulsion to feed on the blood of buxom young maidens, and instead bills him almost as the Devil himself as he executes his master plan. This outing dispenses with the cheesy pop-culture parodies of the previous film and as a result the the Van Helsing-driven plot-line becomes a much more interesting affair as he tries to unravel a mysterious plot involving a new strain of Bubonic Plague and a house where occult rituals are taking place. Christopher Lee however took part in the film under protest and only appears towards the climax of what would mark his last Hammer film with Peter Cushing. 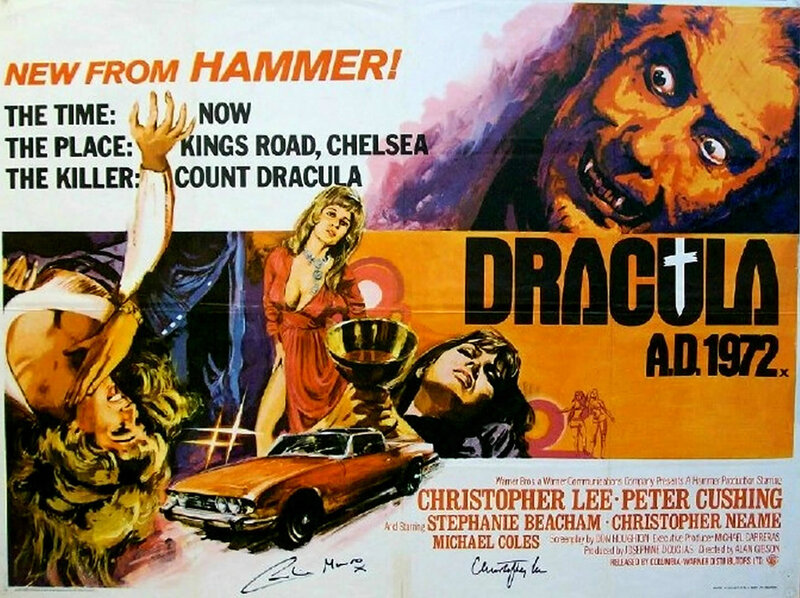 Director Alan Gibson also returned to carry on where he left off with Dracula A.D. 1972. The only major casting change was this inclusion of Joanna Lumley (On Her Majesty's Secret Service, The Trail Of The Pink Panther) as a more mature Jessica Van Helsing compared to Stephanie Beacham (The Saint, UFO). Despite its more sensible style and a plot that included elements of science fiction as well as mystery, the film has not endured well with most critics tending to summarise it negatively (though more favourably than it's predecessor). 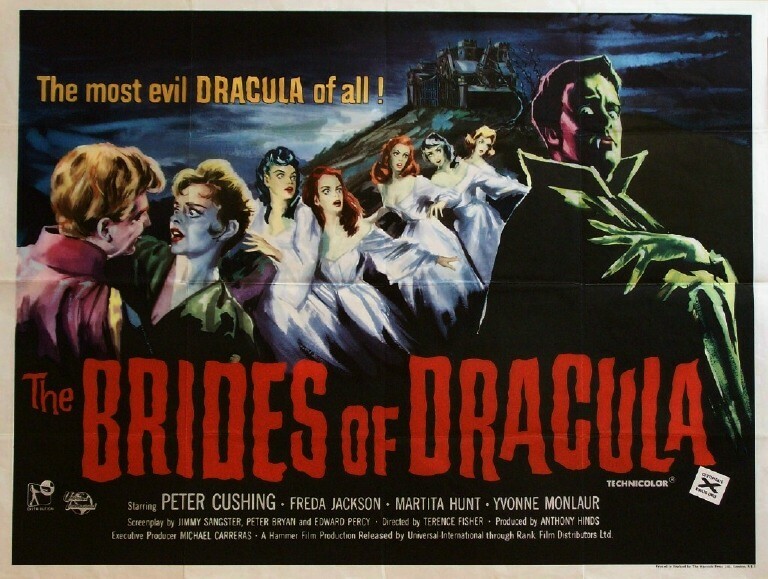 This also happens to be the only film in the Dracula series not currently in print on DVD. A new release had been promised by Hammer Films, but it has not materialised, much to the vexation of completists. 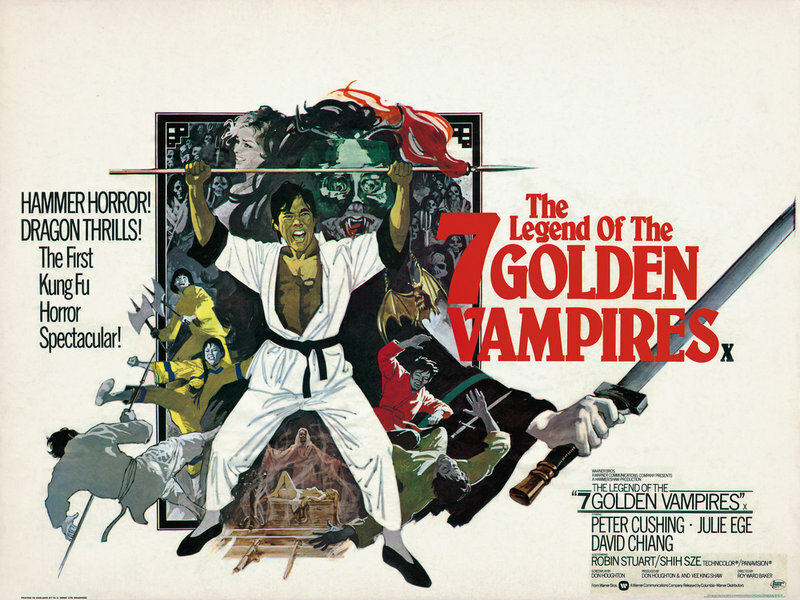 The final film in the series is a brave departure for Hammer as the studio tried to capitalise on the popularity of martial arts films for this outing. Again, this film is driven by the Van Helsing character, along with his son Leyland, who seems to be back in 1904, somewhere around the original timeline for the series. This is the only film in the series that sees the Dracula character played by anyone other than Christopher Lee. The count is instead played by John Forbes-Robertson (and re-dubbed by David de Keyser) who only appears in his true form at the beginning and end of the films, while Keyser gives a wooden delivery constrained by the on-screen performance. Roy Ward Barker returned to the directors chair with help from Hong Kong film fight director Chang Cheh to give it some credibility for the market it was aimed at. The end result however was a complete mishmash of genres that only served really to confuse the plot. But again the film retains a certain innocent charm that has given it, like Dracula A.D. 1972 before it, a cult following. 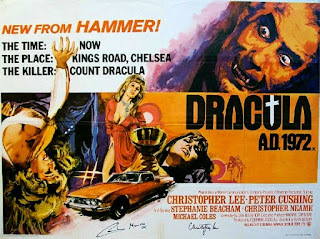 It is by no means the best film Hammer have ever produced, let alone the best Dracula, however it does embody a breed of adventurous (if slightly desperate) style of film making that perhaps was better executed in a film like Dr. Jekyll And Sister Hyde. But the basic fact remains that this isn't at all a satisfying curtain call for the count's tale. That's the end of part two. We've now looked at both the strengths and weaknesses of these classic horror chronicles. But which do you think is the best? Have your say on the Intravenous Magazine Facebook page HERE.